Jim Anderson is an internationally recognized recording engineer and producer of acoustic music for the recording, radio, television, and film industries. He is the recipient of numerous awards and nominations in the recording industry: his recordings have received ten Grammy and Latin Grammy awards and 26 Grammy and Latin Grammy nominations; his radio recordings have received two George Foster Peabody Awards and two Emmy nominations for television programs. A graduate of the Duquesne University School of Music in Pittsburgh PA, Jim has studied audio engineering at the Eastman School of Music and Sender Freies Berlin. During the 1970s, he was employed by National Public Radio and engineered and produced many award-winning classical, jazz, documentary, and news programs. 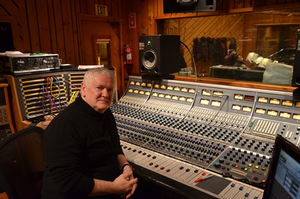 Since 1980 Jim has had a career as an independent audio engineer and producer, living in New York City. He has been a frequent lecturer and speaker for the Audio Engineering Society and master-class guest faculty member at leading international universities and institutes. He is a professor of recorded music with the Clive Davis Institute of Recorded music in the Tisch School of the Arts at New York University and was the department’s Chair from 2004 – 2008. He has served as Vice President for Eastern Sections of the Audio Engineering society (AES), chaired the New York Section of the AES and was Chair of the 119th, 123rd, and 131st AES Conventions. In 2006, he was made a Fellow of the AES and has received four AES’ Board of Governors Awards. He was the President of the Audio Engineering Society, 2008-2009. In 2013, his remix of Patricia Barber's "Modern Cool," in 5.1 surround sound, won the Grammy for Best Surround Album at the 55th Grammy Awards. "Sixteen Sunsets" by Jane Ira Bloom was nominated for Best Surround Album in 2014. In June of 2013, he was voted by the graduating class of his high school, in Butler, Pennsylvania, as the recipient of its Distinguished Graduate Award. Jim can fold and unfold a Brompton in under 20 seconds.